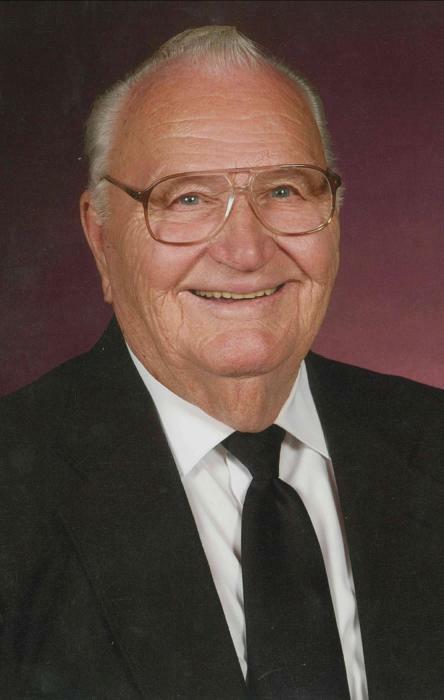 JERSEYVILLE - William Eldon East, 93, died at 3:55 p.m., Saturday, February 2, 2019 at Mercy Hospital South in St. Louis, Mo. He was born in McClusky, Illinois on September 9, 1925, the son of Parker and Ruby Frances (Vanausdoll) East. Surrounded by agriculture his entire life, he owned and operated Shady Lawn Dairy, where his day started way before dawn delivering milk door to door throughout Jersey County, many times with one of his children as his co-pilot. At one point, he knew everyone in the county, where they lived and who their children were. He treasured the relationships he built with his customers and friends. He later began working as a Propane Route Salesman for Jersey County FS in Jerseyville, where he once again was able to surround himself with his loyal customers and friends. He retired in 1988 after nearly 20 years of service. He enjoyed pheasant and quail hunting, was an avid St. Louis Cardinals fan, however his favorite pastime was sitting in his backyard on his swing where he was able to enjoy the tranquility of nature and reflect back on all the wonderful blessings that he had been given throughout his life. He married the former Dorothy Harting on November 27, 1947, and together they have been blessed with 71 years of a wonderful life, as well as the joys of a family that consisted of ten children. Surviving are his wife, Dorothy East of Jerseyville; nine children and their spouses, Melody and Roger Vetter of Jerseyville, Debbie and Doug Koch of Naples, Fl., David East of Kane, Turese and Kent Beiermann, Bill and June East, Jeri and Rusty Kuehnel, Pati and Mark Carpunky, Rosemary and Doug Mann and Matt and Ann East all of Jerseyville; 40 Grandchildren; 49 Great Grandchildren; and six great great grandchildren. In addition to his parents, he was preceded in death by a son, William Randall East on Apr. 2, 1951; a brother, Vernon East; three sisters, Marjorie Love, Dorothy Cope Davenport, and Lillie East in infancy; a great grandson, Garrett Short; and some very special uncles and aunts. Visitation will be from 3 p.m. Friday until time of funeral services at 7 p.m. at the Crawford Funeral Home inJ erseyville. Rev. Robert McNutt will officiate. Private burial will take place at St. Mary's Cemetery in Fieldon. In lieu of flowers, memorials may be given to the Grace Community Baptist Church in Jerseyville or to Shriners Hospital.